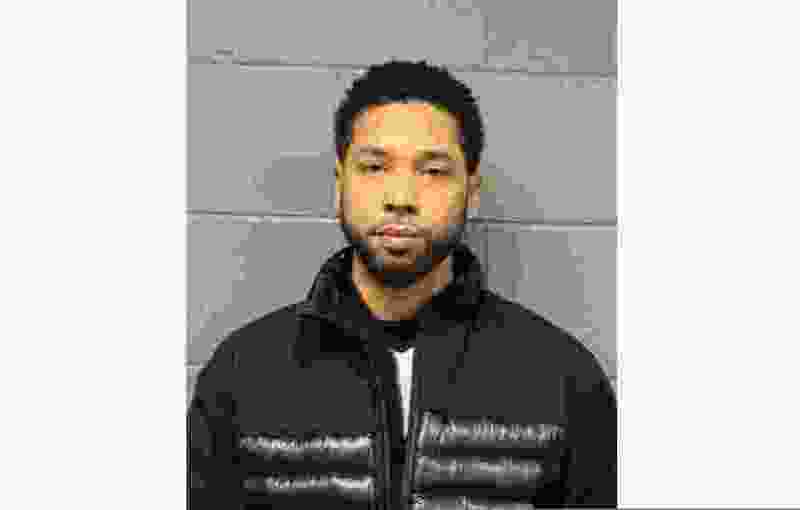 (Chicago Police Department | The Associated Press) This Feb. 21, 2019 booking photo released by Chicago Police Department shows Jussie Smollett. Police say the "Empire" actor has turned himself in to face a charge of making a false police report when he said he was attacked in downtown Chicago by two men who hurled racist and anti-gay slurs and looped a rope around his neck. Police spokesman Anthony Guglielmi says Smollett turned himself in early Thursday and was arrested. The charge could bring up to three years in prison for the actor, who's black and gay. Chicago • “Empire” actor Jussie Smollett staged a racist and homophobic attack because he was unhappy about his salary and wanted to promote his career, Chicago’s police superintendent said Thursday. "He took advantage of the pain and anger of racism to promote his career," Johnson told reporters at a news conference. "This publicity stunt was a scar that Chicago didn't earn and certainly didn't deserve," he later added. The whispers about Smollett’s account started with reports that he had not fully cooperated with police after telling authorities he was attacked. Then detectives in a city bristling with surveillance cameras could not find video of the beating. Later, two brothers were taken into custody for questioning but were released after two days, with police saying they were no longer suspects. Johnson said Smollett paid the brothers $3,500 to stage the attack. Following three weeks of mounting suspicions, Smollett was charged Wednesday with felony disorderly conduct, a charge that could bring up to three years in prison and force the actor, who is black and gay, to pay for the cost of the investigation into his report of a Jan. 29 beating. The brothers are not considered suspects. Johnson said they wore gloves during the staged attack and "punched him a little bit." He said scratches and brusing Smollett had on his face were "most likely self-inflicted." In a statement Wednesday, attorneys Todd Pugh and Victor Henderson said Smollett "enjoys the presumption of innocence, particularly when there has been an investigation like this one where information, both true and false, has been repeatedly leaked." Smollett, who plays a gay character on the hit Fox television show "Empire," said he was attacked as he was walking home from a downtown Subway sandwich shop. He said the masked men beat him, made derogatory comments and yelled "This is MAGA country" — an apparent reference to President Donald Trump's campaign slogan, "Make America Great Again" — before fleeing. "Empire" is shot in Chicago and follows a black family as they navigate the ups and downs of the recording industry. After reviewing hundreds of hours of video, detectives did find and release images of two people they said they wanted to question and last week picked up the brothers at O'Hare International Airport as they returned from Nigeria. Police questioned the men and searched their apartment. The day after they were released, police said the men provided information that had "shifted the trajectory of the investigation," and detectives requested another interviewwith Smollett. Police said one of the men had worked on "Empire," and Smollett's attorneys said one of the men is the actor's personal trainer, whom he hired to help get him physically ready for a music video. The actor released his debut album, "Sum of My Music," last year. Smollett was charged by prosecutors, not the grand jury. Police spokesman Anthony Guglielmi said the brothers appeared before the panel to "lock in their testimony." For an investigation that took a single day, his client had to split restitution of $8,400, Weisberg said. In Smollett’s case, "I can imagine that this would be easily into the hundreds of thousands of dollars.